Ethnic Uighurs sit near a statue of China's late Chairman Mao Zedong in Kashgar, Xinjiang Uighur Autonomous Region, China, March 23, 2017. People of the Uighur diaspora are lobbying governments around the world to pressurize China to release information about the fate of their missing family members. The Chinese government has tightened its grip on the far western Xinjiang province, calling it a campaign against religious extremism. The United Nations estimates that up to 1 million minority Muslim Uighurs could be held involuntarily in the so-called political re-education camps under the "broad definition of terrorism, and vague references to extremism, and an unclear definition of separatism in Chinese legislation." Officials in Beijing have rejected those accusations and have said their actions are only aimed at Islamist militants and separatists. VOA interviewed several Uighurs who have lost family members in the detention camps or are still waiting to know their whereabouts. They said they were traumatized and haunted by the experience. One is Gulgine Mamut, a mother whose son, Pakzat Qurbanjan, was arrested in 2016 when he was only 16 years old. She is now taking refuge in Turkey. "They arrested my son at Urumqi city's airport as he was coming back to visit home," Mamut told VOA, adding he was accused of conspiring against the state. "They have sentenced my innocent son to 13 years in prison in Urumqi. I was told his charge is the subversion of state power." Mamut's son was kept in a juvenile prison in August 2017 but was later transferred to a "concentration camp." "I call upon the U.N., human rights organizations and powerful countries to try and rescue my son and many other innocent Uighurs incarcerated in Chinese prisons," she said. Amina Muhammadjan, another mother and a Uighur refugee in Turkey, wept as she told VOA about her missing daughter, Guher Nijat. She said Nijat was arrested in Urumqi as she was preparing to join her mother abroad. "I was only told that she was in a prison. I do not even know where or for how long she is sentenced. It has been 16 months since I had any news of her," Muhammadjan said. 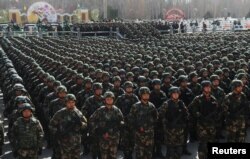 Paramilitary policemen stand in formation as they take part in an anti-terrorism oath-taking rally, in Kashgar, Xinjiang Uighur Autonomous Region, China, Feb. 27, 2017. Muhammadjan and Mamut are not the only ones cut off from relatives stranded in Chinese camps. Diaspora members interviewed by VOA said even those who are free in Xinjiang province are unable to stay in touch due to strict government control over communication. Uighur refugee Hesenjan Abdukerim, 35, fled to Egypt in 2013 after learning that Chinese authorities were after him. He said he has been unable to contact his family since early 2017. "On the 5th of July 2013, I learned that my child was born, and I decided to return home to name her. But my mother told me not to come back, because the police had been asking about my passport and would arrest me. So, I left the country without being able to see my newborn child," Abdukerim told VOA. Abdukerim said he was desperate to know about his family. He asked traders from Kyrgyzstan traveling to Xinjiang for business to find out about his family. He was told that his 65-year-old father was put in the education camps 15 months ago. "He is innocent, and I did not commit any crimes," Abdukerim told VOA. "This is a plain violation of human rights. We are living without any freedom or dignity. I am seriously traumatized feeling my father is suffering because of me." Nearly all diaspora members interviewed for this story said they could not contact missing relatives in Xinjiang province because of government control. The difficulties reporting from the predominantly Muslim region are confirmed by international rights organizations. An ethnic Uighur stands in front of a grave at the cemetry surrounding the tomb of Imam Asim in the Taklamakan Desert outside the village of Jiya near Hotan, Xinjiang Uighur Autonomous Region, China, March 21, 2017. A report last week by Amnesty International, a global rights organization, found that prisoners inside the camps were allegedly forced to reject practices deemed Islamic or contrary to China's dominant Han culture. It said those who resisted or failed to show enough progress were subjected to beatings and other forms of torture. "The mass detention camps are places of brainwashing, torture and punishment," said Nicholas Bequelin, East Asia director at Amnesty International. "The Chinese government must not be allowed to continue this vicious campaign against ethnic minorities in northwest China," he added. The Chinese government has for decades tried to push back against a separatist movement by Uighurs to establish an independent state called East Turkestan. Uighurs accused the government of forcing demographic changes by settling millions of Han Chinese in the region. 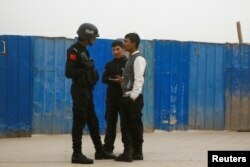 A police officer talks to men in a street in Kashgar, Xinjiang Uighur Autonomous Region, China, March 24, 2017. In response to the international outcry, Chinese officials have vociferously defended their policy and called the accusations of mass imprisonment "completely untrue." They said their security efforts in the province are to prevent Islamic State's emergence and to contain the Turkistan Islamic Party. Speaking on a panel by the U.N. Committee on the Elimination of Racial Discrimination last August, China's representative, Hu Lianhe, said the camps were "vocational, educational and employment training centers" set up to rehabilitate criminals convicted of "minor offenses." "They are not subject to any arbitrary detention or ill treatment there," he said. For Uighur activists lobbying for their loved ones, China's denial of extreme measures in Xinjiang is nothing new. "It is not surprising that the Chinese government will deny the existence of those concentration camps," Dolkun Isa, head of Germany-based World Uighur Congress, told VOA. "They will continue denying it, but they cannot hide it when they are locking up over 1 million people." Isa, who was informed last June that his 70-years-old mother died after spending over 1.5 years in detention, said he was optimistic that the international community was finally paying more attention to his people's plight. He said the most difficult challenge facing Uighur activists was to convince countries with strong economic ties to China to speak up against it. The United States is reportedly already weighing sanctions against Chinese officials. "It will be difficult, but we are finally making progress, considering how far we have come," Isa said.